Oconto WI takes its name from the Indian word for plenty of fish, so bring your fishing rod and tackle box! Oconto is located on the west coast of Green Bay, between Menominee MI and the city of Green Bay WI. It is a quiet riverside town about 1 nm up the Oconto River. Its roots go back 6,000 years. The earliest people here were known as the Old Copper people. They smelted raw copper to make tools and ornaments and they also buried their dead, which was unusual among the indigenous people of North America. They were among the earliest metal workers in the Americas and their burial grounds constitute the oldest dated cemetary in North America. The first Europeans to come into the area were French missionaries, led by the great Jesuit explorer and missionary Claude-Jean Allouez, and fur traders. With the decline of the fur trade, commercial efforts turned to lumbering and the first half of the 19th century saw a boom in mill construction and activity. The arrival of the railroad added to Oconto's importanceand it's harbor became a major port. 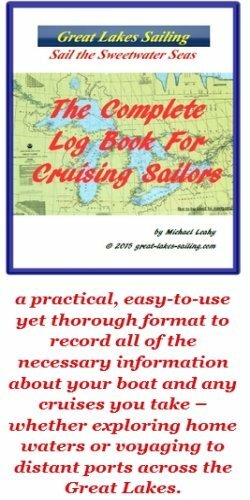 In the 20th century, as lumbering declined, other industries moved in - including the recreational boat builder Cruisers Yachts which employs about 1,000 people. Oconto, WI makes an excellent stop-over on the way to or from Green Bay. The approach to Oconto WI is straightforward. The entrance channel into the Oconto River lies between two breakwaters that extend out into Green Bay. The north breakwater pierhead is marked with a F RED light, visible approximately 7.3 nm. The south breakwater pierhead is marked with a Fl GREEN light, visible approximately 5.2 nm. Once inside the protected channel, watch for a Q RED light marking a breakwater that extends out into the channel from the north breakwater. It is important to stay in the channel as the surrounding water is very shallow. There are 3 marinas and a yacht club in Oconto WI. All are accessed by going up the Oconto River. There is a channel that extends as far as Breakwater Park Marina. Beyond Breakwater Park Marina, the charted depths are low. This will fluctuate with overall water levels. The yacht club which is furthest upstream, can accomodate sailboats. However, prudence would suggest moving at a slow, cautious pace, watching the depth sounder. Power vessels will have less concerns but caution should still be exercised. Breakwater Park Marina is the first marina up the Oconto River. It is located right at the land end of the north breakwater There are 50 slips with 30 set aside for transient sailors. There is no fuel dock or pumpout facility. Water, power and wifi are available at the docks. There are restrooms and showers. There is a very good restaurant at the Marina as well as BBQ grills on the property. The town is located about 1.5 mi/2.4 km from the Marina and there are bicycles that can be borrowed for a trip into town. Harbor Cove Marina is located approximately .6 nm up the river. There are 40 slips with at least 4 set aside for transient sailors.There is no fuel dock or pumpout station. Water and poer are available. There are restrooms and showers available as well. Hi Seas Marina is located about .8nm up the Oconto River. They have 65 slips and at least 3 available for transient sailors. There is a fuel dock (diesel and gasoline) and pumpout station. This is a full-service marina capable of carrying out engine, mechanical and fibreglass repairs and maintenance. There are restroom, shower and laundry facilities and a ship's store. Other amenities include BBQ grills, internet access and wifi at the docks. Oconto Yacht Club is approximately 1nm up the river. There are 35 slips with several available for transient sailors. There is no fuel dock . There is a pumpout facility. Water and power are available. The club has a well-equiped clubhouse with restrooms, showers and laundry facilities. There is a lounge, bar and fully-equiped kitchen. There is a BBQ grill outside and picnic tables. Family Dollar Store carries groceries and seasonal items. It is about 2 mi/3.2 km from Breakwater Park Marina and 1 mi/1.6 km from Oconto Yacht Club. Huntington Bank has counter and ATM service. It is about 2 mi/3.2 km from Breakwater Park Marina and 1 mi/1.6 km from Oconto Yacht Club. Bellin Health Oconto Hospital and Clinic (920) 834-7373 provides comprehensive medical care. It is located about 2.4 mi/3.8 km from Breakwater Park Marina and 1.3 mi/2 km from Oconto Yacht Club. Oconto Pharmacy (920) 834-3257 is located about 3 mi/5 km from Breakwater Park Marina and 1 mi/1.6 km from Oconto Yacht Club. Oconto Dockside Restaurant is located right at Breakwater Park Marina It is a full-service dining room with a patio that overlooks the river. Crivello's is a restaurant downtown serving all-day breakfast as well as a full menu of steaks, chicken, pizza, etc. The Log Jam Saloon, don the street from Crivallo's is a popular bar and grill. Oconto WI 's Copper Culture Museum preserves and explains the legacy of the original inhabitants of this area. These indigenous people derived their name from the extensive work they did with copper they dug and refined. Early July, the air is full of polka music as the Annual Pulaski Polka Days kick off. There is a Summer Sunset Concert Series held one weekend each in July and August. This Oconto WI information site will give you ideas of more things to do and see while visiting the area.